As a motion picture, The Monuments Men is a mixed bag. I’d give it three stars out of five. A sour critic writing in the December 12 issue of Entertainment Weekly dubbed it the fifth worst movie of the year. That reminded me of the two gentlemen at the Smithsonian’s Air and Space Museum — one the director, the other the exhibit curator — who, putting together an exhibition on Hiroshima, elected to rewrite history. One of the men had been born in Czechoslovakia, and the other was a Canadian. Their revisionist, anti-American take was so odoriferous that it raised the hackles of Congress and the American Legion, and both men were soon gone. The trouble with the George Clooney-directed The Monuments Men is that it tried to distill an understandable scenario out of a subject that was simply too, too big to capture in a two-hour film. So, much had to be left out that gave the story substance and genuine heart-stopping drama. In other words, the Robert Edsel book is much better than the movie. Shortly we will be fighting our way across the Continent of Europe in battles designed to preserve our civilization. Inevitably, in the path of our advance will be found historical monuments and cultural centers which symbolize to the world all that we are fighting to preserve. It is the responsibility of every commander to protect and preserve these symbols whenever possible. In the course of the war, lesser generals and officers sometimes had trouble following these orders and were in conflict with the Monuments Men trying to enforce them. 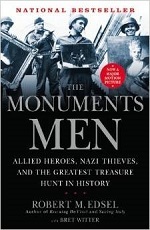 The Monuments Men is about six lower-rank officers and two enlisted soldiers with art backgrounds who were assigned to various Allied armies during the Liberation. They had little military standing, but they were given the task of cajoling commanders into sparing cultural targets. They identified and cataloged art, objects, and structures that survived devastation. They looked for missing pieces. Except when they found really big caches of art the Nazis had stolen, they had no crews to help them, and in most cases didn’t even have their own transportation — no trucks, no jeeps, only the rides they could beg when they needed to get from one place to another. For the most part, they worked singly and could not often confer one with another. Each had separate adventures. That’s what made the Clooney film so impossible to depict as a harmonious, understandable unit. The film could not include the contexts that made each story so vital. And each of these men had a scad of individual stories and adventures. A dozen movies could easily have come from the book’s material. Overshadowing all these adventures was the huge avaricious web of Nazi theft a tangled subculture of crooked dealers, thieves, forgers, black marketeers, brigands, and traitors; and the Underground, which was locked in an unwinnable war trying to preserve cultural patrimonies. In a much-earlier column I recounted the near-destruction of the Chartres Cathedral. The cathedral was largely completed by 1250, putting its soaring stained glass windows among the most glorious in the world. These impressive windows have survived for more than 750 years. Just before World War II the windows were removed for safekeeping. There is no way to hide a whole cathedral. During the Liberation, Allied intelligence reported the cathedral was being used as a German observation post, and American bombers were planning to level it. Colonel Welborn Griffith questioned the plan and volunteered to go behind enemy lines with a single enlisted soldier. They discovered the Germans were not using the cathedral. Bombing plans were scrapped. Although Griffith was not one of the Monuments Men, his story is a good example of what the men were dedicated to do. Sometimes they were trying to save a village containing important artifacts from destruction, sometimes they were trying to save only a church or a suspected repository where rumor had it stolen art was being concealed, and sometimes they could only write cultural death notices as the war moved on. To understand the complex, dangerous exploits of the Monuments Men, we must step back a few years to examine the beginnings of this snarled, black web in which their dramas played out. In his insanity and ruthlessness, Adolph Hitler genuinely believed his Third Reich would last a thousand years. As its instigator, his name would be glorious. So the monuments to his glory had to be glorious. Hitler was a failed landscape painter. One of the reasons he failed, other than insufficient talent, was that he could never bring his taste into the 20th Century. Even before the war erupted, this art was being seized, often confiscated from important German museums. To demonstrate his hate, exhibitions of “refused” art were held. Some of the condemned pieces were sold abroad to succor Hitler’s plots, but the majority went to the flames. Only good, old-time Germanic art was really good enough. Hitler planned five great Führer Cities to exalt his achievements and serve as Nazi ideological centers: Berlin, capital of the Third Reich; Munich, the capital of the Nazi movement; Hamburg, the gateway to the world; Nuremberg, the city of Party Congresses; and Linz, Austria, the city of Hitler’s youth. Compared to the four cities in Germany, Linz was a backwater. But it exerted a compelling force in Hitler’s pathological psyche. There, in his home town overlooking the Danube, Hitler intended to build the greatest cultural center in the world. Besides the Führer Art Museum, which would espouse the Nazi doctrine of art and be greater than any other museum in the world, the new megalopolis would include an Adolph Hitler Hotel, a 500-feet-high bell tower to house the remains of the Führer’s parents, a parade ground that could accommodate 100,000 of his followers, and a festival hall that could handle 30,000 of them. The museum was to be two-thirds of a mile long and would eventually be the repository for 16 million works of art. 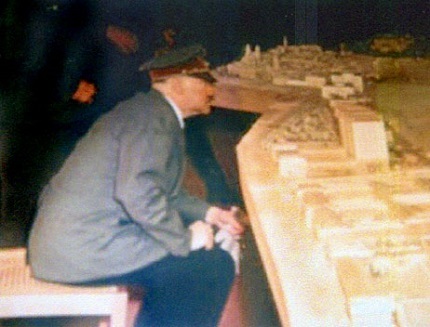 Hitler examining models of the proposed Führer megalopolis in Linz. 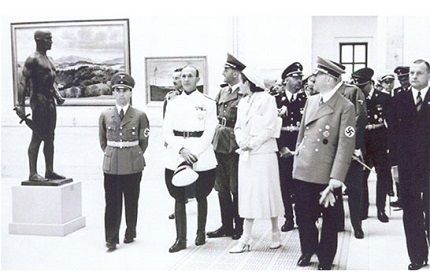 The cultural patrimony of Europe was simultaneously raped by two competing forces: the black art army scrounging for Hitler and the equally black art army scrounging for Herman Göring. Art-insatiable Göring pretended the two were not in competition. Before Germany surrendered, a third black army (it was really red) would crash the scene, intend on seizing any art in German hands, regardless of original ownership, and hauling it back to Russia, spoils of war and reparations. That explains the last drama in the movie, a Monuments Men effort to rescue the overwhelming quantity of stolen art hidden in Austrian salt mines before the Red Army arrived to take it all.